ROBERTO E. ROSALES / JOURNAL Parishioners carry a life - size life-size wooden statue of Jesus Christ in a procession around Old Town Plaza on Friday evening as part of El Descendimiento, a Good Friday ritual observed at San Felipe de Neri Catholic Church for about 150 years. 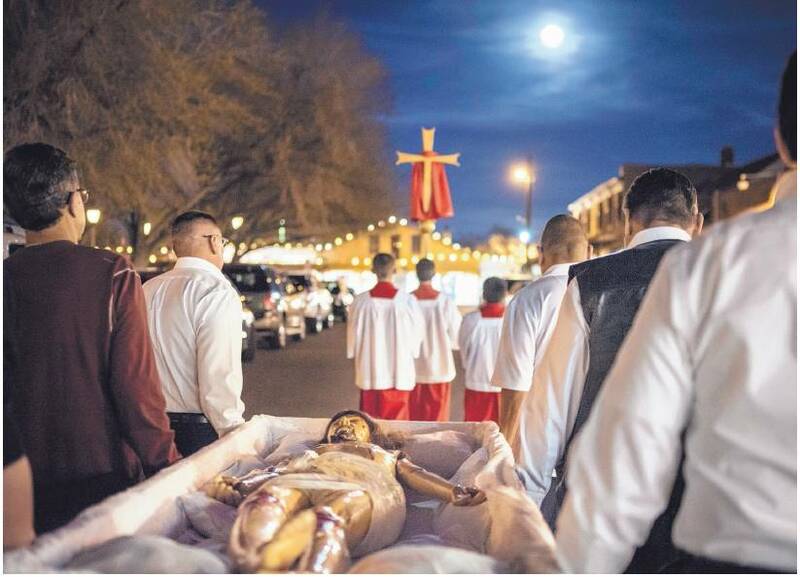 Parishioners of San Felipe de Neri Catholic Church carry a casket bearing a life - size life-size statue of Jesus Christ out of the church Friday evening as part of El Descendimiento, a Good Friday ritual observed at the church for many generations. A statue of Our Lady of Sorrows is pictured in the background. ROBERTO E. ROSALES / JOURNAL Members of San Felipe de Neri Catholic Church bear a statue of Our Lady of Sorrows during Friday evening ' s evening's El Descendimiento procession around Old Town Plaza. 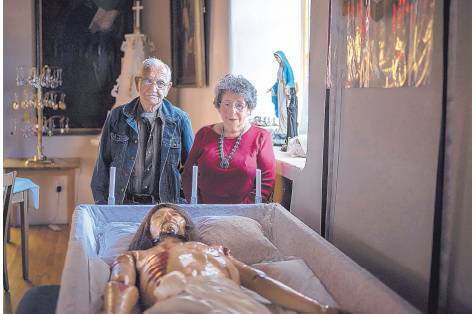 Deacon Jos é José Lucero of Albuquerque ' s Albuquerque's San Felipe de Neri Catholic Church and his wife, Rosella, stand beside the life - size life-size statue of Jesus Christ in the San Felipe de Neri museum in Old Town. The statue plays a central role in El Descendimiento, a Good Friday ritual observed in San Felipe de Neri Parish for about 150 years or more. As they move around the casket, washing its long-haired occupant with water and rosemary oil and adjusting the white linens in the coffin, Annabel Griego and JoAnn Ulibarri talk to each other and to several others nearby. They smile, even laugh. 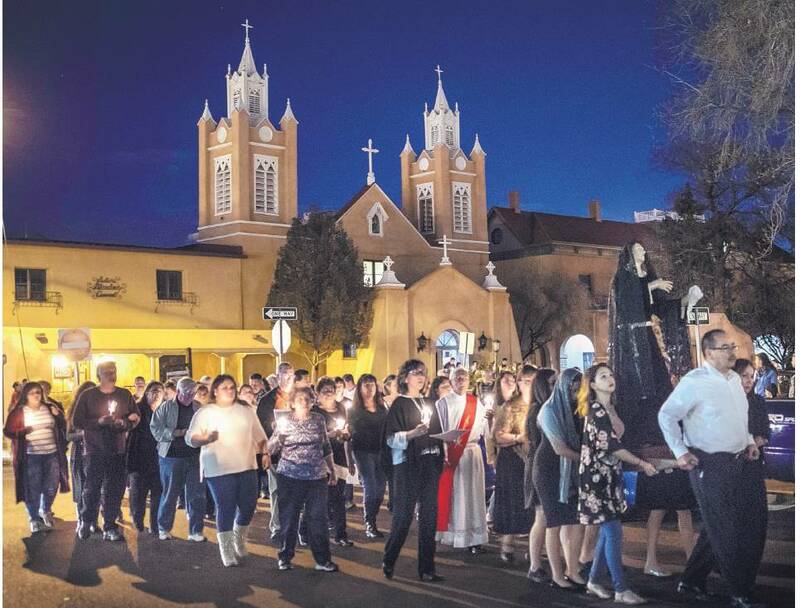 Sometimes, Ulibarri, a choir director at Old Town's San Felipe de Neri Catholic Church, hums softly to herself while she and Griego work this past Monday, the second day of Holy Week. But the pervasive feeling in this small room, the San Felipe de Neri museum on the west side of the church, is one of reverence and responsibility taken to heart. And a touch of uncertainty, too, because Griego and Ulibarri are still new at this.
" How do you tie a loincloth? " Griego asks. 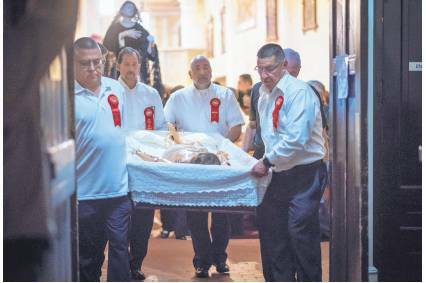 recent in a succession of San Felipe de Neri Parish women charged with preparing the figure in the casket, a life-size statue of Jesus Christ, for El Descendimiento, a Good Friday tradition in the parish for about 150 years or more.
" It's a prayerful thing for JoAnn and for me," Griego says." It is preparation for the next few days, for Jesus being crucified and for the Resurrection. It is part of our preparation for the celebration of Easter." San Felipe de Neri is one of the increasingly rare places at which the old ritual of El Descendimiento, which means " the descent," is still observed. It has deep roots in the parish, which was founded in 1706. A diary entry recorded by priests at San Felipe de Neri in March 1872 refers to the celebration of El Descendimiento in the parish that year. And it may well have been practiced at the church much earlier than that. El Descendimiento is part of the devotion known as the Stations of the Cross, which recalls Christ's suffering and death. Stations are prayed at many Christian churches, but it is El Descendimiento that makes the stations service at San Felipe de Neri on Good Friday evening different. On Good Friday afternoon, the 6-foot statue of Jesus -which is jointed so that its head, arms and legs move in a manner resembling an actual body - is removed from the church museum by men of the parish and bolted to a large cross positioned at the center of the altar. After the 13 th station, the statue is taken down ( thus the descent ) from the cross and placed in a casket, which is carried around Old Town Plaza as the faithful, singing and carrying lighted candles, follow in procession before returning to the church for the conclusion of the service. After Stations of the Cross, members of the congregation approach the statue in the casket to express their love for Christ and their pésame ( condolences ) to Mary, his mother. Rosella Saavedra Lucero, 75, who went to San Felipe de Neri Catholic school as a youngster and is married now to parish Deacon José Lucero, attended El Descendimiento services at San Felipe de Neri Church as a girl in the 1950 s.
" I remember witnessing Christ being taken down from the cross," she said." To me it was like ' aaahhh! ' It was unbelievable. I knew about the church. I had been going to Catholic school. But to see Christ on the cross, to see him taken down. How does that happen? I remember asking my mother, ' How did Jesus move? ' "
All these years later, she finds El Descendimiento beautiful, meaningful, a vital connection to her past, her family and her faith. The Rev. Andrew J. Pavlak, who was installed as pastor at San Felipe de Neri just before Easter in 2016, said the Catholic liturgy is pretty much the same all over the world, but he feels local customs and traditions, slight variations on the main structures, such as El Descendimiento, are important and need to be preserved.
" You do what is important to the people of the community, what touches their hearts and their souls," he said." What is it you want to do? How do you want to live this experience?" Pavlak believes the ritual of El Descendimiento comes down to us from the Penitente brotherhood, a lay organization of Roman Catholic men active in northern and central New Mexico and southern Colorado. Founded early in the 19 th century, when there was a shortage of priests in the region, Penitentes dedicated themselves to mutual aid, community charity and memorializing the suffering of Christ. In the past, they were best known for practicing severe self-discipline and are still known for their songs of worship, called alabados. It's appropriate then that San Felipe de Neri Deacon José Lucero, the man who has for many years been in charge of El Descendimiento in the parish, is a Penitente. Lucero, 85, a native of northern New Mexico, has, in fact, been the Archdiocese of Santa Fe's spiritual director for the Penitentes since the 1990 s.
He coordinates San Felipe de Neri's El Descendimiento service, which includes three Penitente alabados; leads the prayers at the Stations of the Cross; and delivers the homily, which this year was about crosses that still exist, the ones we must bear individually and the ones that burden the world.
" The part of El Descendimiento that touches me most is when we are lowering Jesus from the cross," he said." It all comes alive. This is what he did for us. That's a lot of love." The long history of El Descendimiento at San Felipe de Neri is well established. And the parish believes the statue it possesses today has been used in the Good Friday ritual since the late 1800 s.
Lee Mann thinks the statue is plenty old enough to have been around back then. Mann, a painter and a professor emeritus from the University of Kansas, where she taught design and photography, resides now in the Old Town area. She began restoring religious statues in the late 1990 s and has restored more than 220 for various parishes and private parties. She doesn't charge for her work, only for materials used in the bigger projects.
" It's a very spiritual thing for me," she said." Each statue has been like a prayer." She started restoring San Felipe de Neri's life-size Jesus statue in November 2012 and finished it just before Holy Thursday in 2013.
" All of the joints, especially the neck, were very, very loose," she said." It had kind of been repaired in the 1970 s, as I understand, with what they had available at the time." What they had available at the time included duct tape. Mann said the 1970 s repairs had been done with the tape and painted over. She said none of the goatskin leather connecting the statue's joints had been replaced at that time.
" I replaced the leather at all the joints," Mann said." At the knees, the leather was totally cracked in two. It took four different layers of leather to reattach the shoulders." She used new goat-skin leather to retain as much authenticity as possible and repainted the statue where necessary. Because of her extensive work on the figure, Mann probably knows it as well as anyone. Based on her research and observations, she thinks it dates from the late 1700 s or the early 1800 s.
" But that's just supposition," she said. The eyes of the statue are closed. Its hair feels real, and Mann said she thinks it is human. Blood-red swaths - vividly rendered reminders of the wounds of Christ - are painted on the figure's neck, shoulders, elbows, hands, side, knees and feet. As Veronicas, Griego says she feels that she and Ulibarri are ministering to the statue in much the same way that the women among Jesus ' followers prepared his body for burial after his death on the cross. This is Griego and Ulibarri's second year as Veronicas, named for the woman who, according to Christian tradition, wiped the face of Jesus as he walked to his crucifixion.
" The first year, we didn't know much," Griego admitted.
" We didn't know how heavy he was," Ulibarri said." It took both of us to lift him." As Griego and Ulibarri are growing into their duties, Deacon Lucero, who retired in December, is relinquishing his. This year is supposed to mark his last time as director of El Descendimiento. He has been training his successor. That's the way it has been for about a century and a half in San Felipe de Neri Parish. The clergy and the faithful come and go, but El Descendimiento, the Good Friday evening procession around Old Town Plaza, endures.
" Easter Sunday doesn't mean anything unless you walk through Good Friday," Pastor Pavlak said.